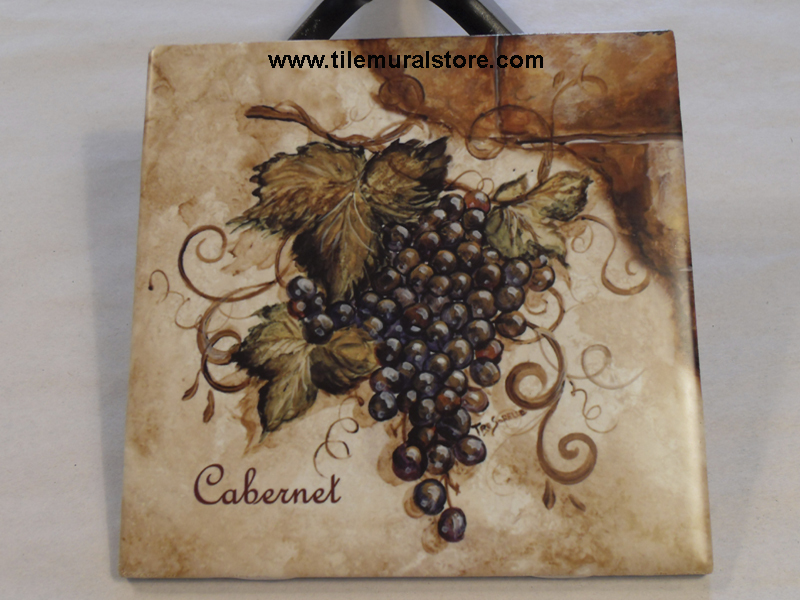 The Tile Mural Store is the only tile mural manufacturer that gives you the freedom and flexibility of so many tile choices. The following information will help you in choosing the right tile size, type and finish for your kitchen backsplash tile project or for your bathroom tile installation. Whether you are remodeling your kitchen or bathroom or building a brand new home and want that extra "something" we are here to help. By offering you so many tile choices you can be assured that your tile project will be the best it can be and so much more. If you still have questions about the type of tile you should choose for your tile mural please, do not hesitate to contact me. I am here to assist in any way that I can. - They are all suitable for indoor wall installations. 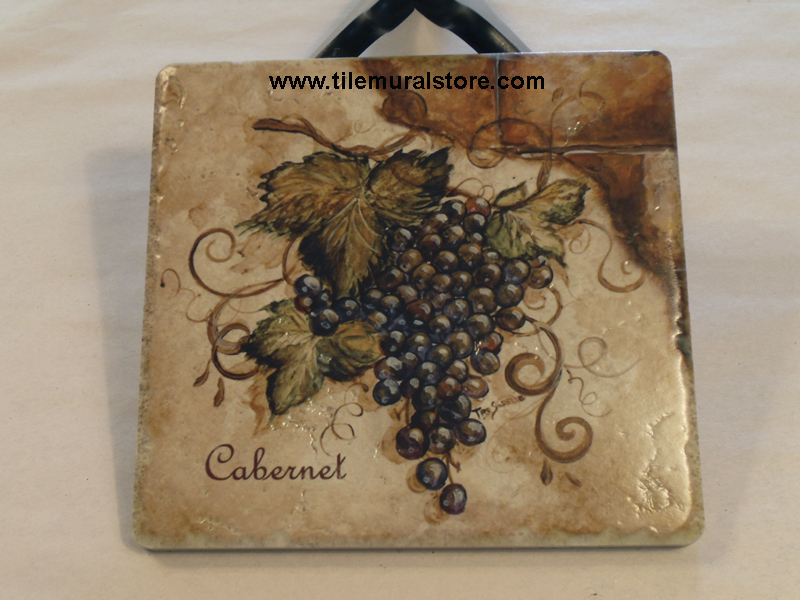 - They are perfect for your kitchen backsplash behind a cooktop or sink. - They are perfect to use in a shower as part of your shower/tub surround. - They are all suitable for outdoor wall installations in shaded areas. - The tiles should not be installed in areas that receive direct sunlight. - They are easy to install just like regular wall tile with tile adhesive and unsanded grout (any color). - We recommend that you do not use spacers between the tiles to keep the grout lines thin. - You will not choose a tile color because the artwork completely covers the surface of the tile. All our Ceramic Tiles have a smooth surface and straight edges. Common sizes are 4 1/4" x 4 1/4" (usually referred to as 4 inch) and 6" x 6". 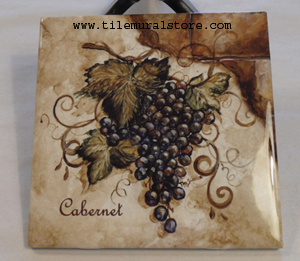 We can customize your tile mural or decorative tile accents and use 2" x 2", 6" x 8", 8" x 10", 8" x 8" or 12" x 12" tiles. We use only high quality Dal-Tile (aka American Olean) tile bodies. You can purchase matching tile bodies at Lowe's Home Improvement Warehouse or most any tile retailer nationwide. All the ceramic tiles are 1/4" thick (standard wall tile thickness) and they have built in spacers that hold the tiles apart by 1/8" to give you a perfectly straight & even grout line. When installing these tiles we recommend that you do not use any additional spacers and just let the tiles space themselves with their handy built in spacers. The ceramic tiles are perfect for use on the wall for your kitchen backsplash behind your cook top or sink or in your bathroom as part of your shower or tub surround. Heat from a cooktop and humidity from a steamy shower have no ill effect on the image. The ceramic tiles can be cleaned daily with any mild detergent or cleaner and a soft sponge or cloth. The ceramic tiles are suitable for any indoor wall installation. The ceramic tiles may be installed outdoors in shaded areas only. Use only unsanded grout (any color is fine) when installing these tiles. If you need tiles for a floor or countertop please call for additional info and options. Scroll down this page to see pictures of and to learn about each tile finish so you can choose the perfect tile for your tile project. Ceramic gloss tiles lend themselves to a modern and contemporary look and feel. These tiles have a high gloss, very shiny finish. Notice the reflective nature of this tile finish in the bottom right corner of the image to the left. The images on the high gloss tiles are bright and vibrant. The glossy tiles are perfect for any kitchen backsplash or bathroom installation especially for images of waterviews and sea life. If you are using a gloss tile or high shine glass tile to finish the rest of your space (field tile) then you'll want to consider the high gloss tiles for your tile mural or decorative tile accents. When matching the tile body for your field tiles with your tile retailer, just ask for glossy tiles manufactured by Dal-Tile or American Olean to get a perfect match for your entire tile project. When choosing ceramic tiles for your project, the most popular finish and the finish we recommed most is the satin finish. Ceramic satin tiles can be used for a contemporary or traditional theme. These tiles have a slightly shiny (like an eggshell) finish. Notice that the satin finish tiles are not reflective but still have that bit of shine that keeps the colors of your tile mural or decorative accent tiles bright and lively. Our satin finish tiles are the perfect choice when using a "store bought" matte finish tile. Dal-Tile and American Olean call this finish "matte" but (not to be confusing here) you will want to use our satin finish tiles to match what they call a "matte" finish. Our satin finish tiles can also be used when you are installing a natural stone field but you want your tile mural to have a clean and bright unobstructed view. The satin finish ceramic tiles blend well with any field tile you choose to install whether it be ceramic or a natural stone. Ceramic matte tiles are used when you don't want any shine at all. These tiles have a completely matte (stone like) finish. These tiles are best used when you are using a natural stone tile like travertine or tumbled stone on the rest of your walls (field tile area) but you want a clean unobstructed view of your tile mural. Notice that the colors become somewhat muted and darker on this finish tile than the gloss or satin. If the mural you are considering is dark in color and nature but you don't like a lot of shine to your tiles, we suggest the satin finish tiles as these matte finish tiles tend to darken already dark colors. 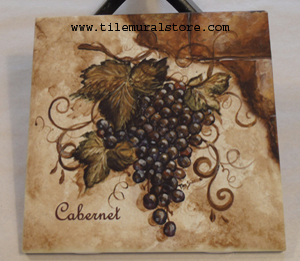 The matte finish ceramic tiles are a great choice for a Tuscan, "Old World" or Country themed space. The matte finish for the ceramic tiles are difficult to match by your tile retailer unless you are using a completely matte natural stone product for your space. The Rialto Porcelain tiles are perfect for any indoor wall application and are perfectly at home behind your cooktop or in the bathroom as part of your shower/tub surround. Choose the porcelain tiles when you want a stone-like finish to your tile project. These tiles have small nicks and pits in the face and textured/chiseled edges but the sides of the tiles are straight with rounded corners. 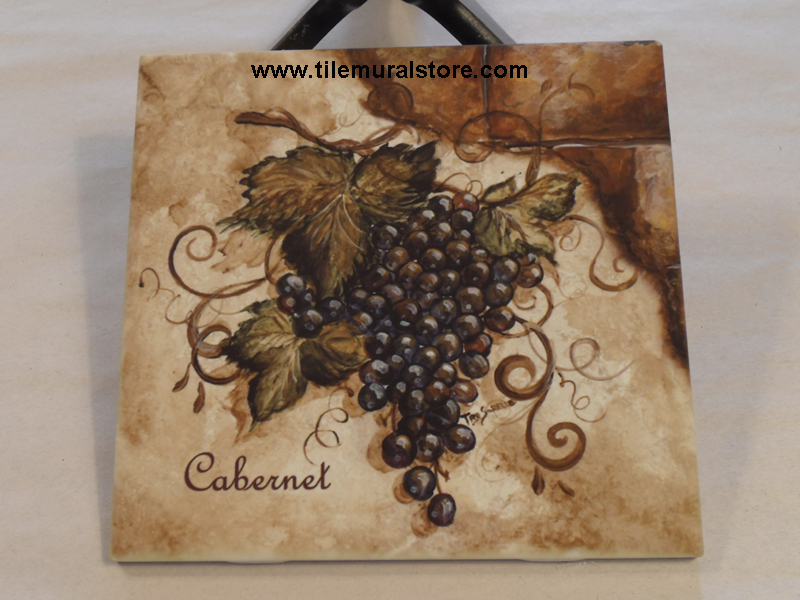 Color may not penetrate into all the nicks and pits which give your tile mural an "Old World" or "Tuscan" feel. These tiles are also used when you want a rustic look for your area. The Rialto porcelain tiles have a slight satin finish (somewhere between satin and matte). The colors or your tile mural or decorative accent tiles will stay vibrant and crisp when you use these tiles. 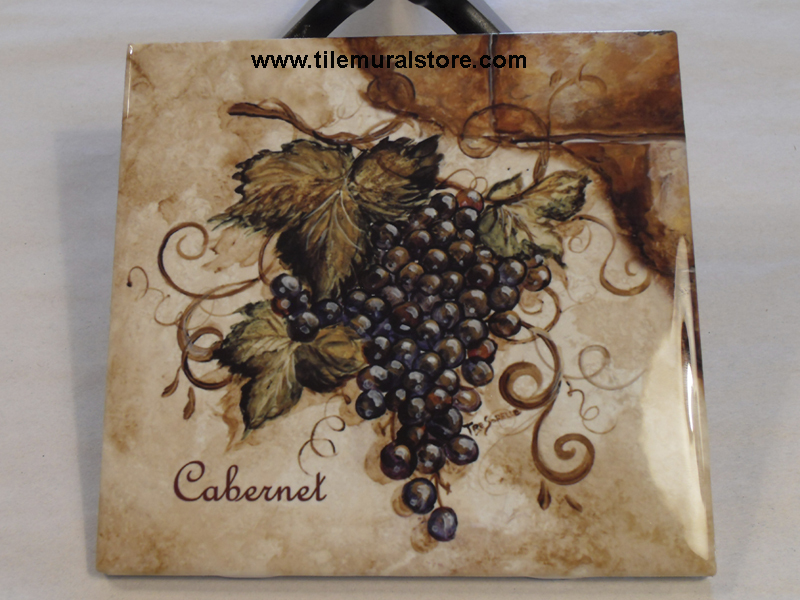 This tile type is the perfect choice for a landscape tile mural with an Italian or Tuscan theme or for an Animal tile mural when you want a rustic cabin like feel. Because these tiles are porcelain and not a true natural stone you never need to seal them and they are impervious to absorption. The porcelain tiles are 5/16" thick Since these tiles are made in Italy they have actual dimensions of 5 7/8" x 5 7/8" (called 6 x 6) and 3 7/8" x 3 7/8" (called 4 x 4). These tiles are suitable for any indoor wall installation and they may be installed outdoors in shaded areas only. Use only unsanded grout (any color is fine) when installing these tiles.